In part two of his interview with Cricket Web, Mathew Sinclair talks about his association with Central Districts, answers questions from our forum members and life after cricket besides other things. You were a legend with Central Districts. Talk to us a little bit about your association with the Stags and how that helped shape you as an international cricketer. Yeah, I’ve represented Central Districts for 20-odd years of my life now, so that’s half my life playing for one association. I’ve had other offers to move up to Auckland and the like, but I turned those down. I like a bit of loyalty, and I think that nowadays you don’t find that in international cricket or even first class cricket. I like giving back, so I enjoy helping out the association. I was picked up at a very, very young age, at about 16 or 17, and got my first professional contract at 17 for CD (Central Districts), which is obviously quite exciting for a guy that age. I went to the New Zealand Cricket Academy, which was set up in Lincoln University just out of Christchurch in my second year of first-class cricket. My first year with CD was poor, but then the next year, I literally broke every record. Again, for me, it was trying to get my head around, okay, I’ve got to be looking at the ball rather than the player, and when I talk about that, I talk about the likes of a Dion Nash and a Chris Cairns coming in and bowling at me in a first-class environment. I found it really hard to get my head around actually how I was going to go about scoring against these guys, so it was a big mental adjustment in my game. CD is a very far-flung area. It’s a very, very big area. It’s not an easy area to play in because every place we go to in the region almost feels like you’re playing overseas because you never get used to the same wicket all the time, so that makes it even more special to what I’ve done for CD. It’ll always be very dear to my heart, that’s for sure. Having served Central Districts so well, did you ever think of making a career in cricket, at the IPL or even the ICL, some kind of county cricket and the various leagues around the world? Absolutely, I think the era I was in the counties especially were looking at choosing Australians because they liked their style of play. The likes of a Steve Waugh started bringing in the quick scoring, and the way they wanted to build their winning squads. I think the counties would like to choose them over us Kiwis, which is a total reversal now because we get a lot of Kiwis playing county cricket. I think that’s also an attribute of how much 20/20 cricket has been played nowadays, and the demands of the professional player now are such where there’s no need for them to go over and play county cricket for four or five months and earn a good living where you can actually earn a living in just under a month playing 20/20 cricket. What’s happening is the cricketers are actually picking and choosing which games they want to get themselves involved with. Yes, I would have loved to play county cricket. If there are a few things that I’ve missed out in my career, one was to play county cricket, the other was to travel to India and the third one was to play at Lord’s. But I’ve loved every minute. I’ve played against the best players in the world, travelled the world for a sport that I love to play. I made some very good relationships. I had the highs and also had the lows, but for me it was bouncing back from those lows and looking for life after cricket now, really. You mentioned that when you made your retirement call from cricket you had to start your life from scratch. How difficult was the call and what are you doing now? I could still be playing first class cricket now. I’m currently Hawkes Bay’s representative player-coach at the moment. So you have first class cricket and then you have light representative cricket. 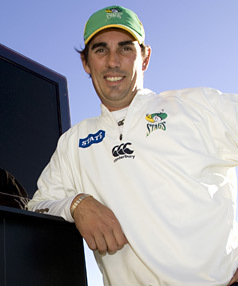 Yeah, I could’ve given the game away and thought, well, heck, go and carry on and do what I wanted to, but I’m always that sort of giving person, and I want to give back to the youth of New Zealand what my experiences were and hope that we can bridge that gap between first class cricket and international cricket where the likes of myself and others are coming in and helping these youngsters. It’s a massive issue here, and unfortunately, we just don’t have the same resources as other international countries when it comes to facilities and monetary requirements. Otherwise, I would fit quite nicely into maybe getting involved with Central Districts and getting into the coaching. I’ve basically got to start my life at ground zero again, as you say, and build my way up. That’s been very, very hard because I’m still not quite sure what I’m good at. Currently, I’m a real estate agent, so I’m getting involved with that. I’m using my profile to try and sell myself in regards to that. It’s a wait and see until things get a little bit better or other opportunities start turning up where hopefully I can jump into that maybe later or in the future. Commentating has always been a pretty cool thing I enjoy doing, so I’m looking at doing some Sky Sport commentating coming up. Yeah, it’s a case of hopefully one door shuts and another one opens. That must be a 180 degree change from cricket to real estate? Yeah, Yeah, it is. Some cricketers do quite well in it. Chris Pringle is a real estate agent as well, so I guess it works in your favour if you’ve got a bit of a profile, a bit of an image, generally, people will want to tag onto somebody that they’ve seen on the international scene because when you’re playing at the top echelon, you’re considered a professional player. The hardest thing is getting that same sort of momentum into a job outside of cricket, because all we’ve ever known is cricket. Unfortunately I don’t have a degree, but I’ve got a degree in life skills. I’m going to ask you three questions from our members. First one, during your career, you faced ageing fast-bowlers like Courtney Walsh, Waqar Younis and Allan Donald. Could you say something about facing such legends toward the back end of their career? Was it easier than you had expected? No, I think it was a lot harder because these guys, even though they were winding down in their career, all three of those guys were very much stats driven, so they had ultimate goals as to how they wanted to end their career, and even though I was starting, I always talk about every ball is an event, and regardless of how old the guy is or how new he is, I’ve just got to go out there and do my job, just like he’s trying to do his job, and his job is obviously to try and get me out, and I’m trying not to get out. I would add Shane Warne to that list. You could say the same about him. It was always a different set of challenges everywhere, be it facing the older guys or the new guys. Second, which bowlers in Test cricket and first class cricket did you have the most difficulty playing against? In international cricket, I found Muralitharan a very, very tough bowler to face. His range of skills to the way he can actually deliver the ball and his ability with the doosra was extremely difficult to deal with. So to bowl a normal off-spinner and turn it the other way is a real massive skill. Not only that, also the consistency and actually putting the ball in the right area, which makes an international player very, very good. I would say the same with Shane Warne as well. If you were to ask me who was he better spinner, I would probably have to say Shane Warne just purely because of his consistency. Yeah, Murali got a lot more wickets than him because of a different action, so as a batter, you’re always looking to try and find out what he’s bowling next. In first class cricket, I’ve always found that the bowlers who are actually wanting to have that intent to get a batsman out have always been the ones that I have had to actually work a lot harder against. I’ve always found I had a really good ding-dong battle with Neil Wagner. He brings that typical South African mentality. It was all about intent. It’s not all about verbally swearing at me, but it’s just an intent saying, “Well, I’m actually here to try to get you out”. That for me is the intent that’s required in first class cricket. Third, do you think your career can teach current and future administrators anything about the value of domestic performances or the importance of continuity and selection when developing a selection policy? Absolutely. Good question, that one. I had talked a lot about trying to bridge the gap between first class cricket and international cricket, and what’s happened now is that we’re finding a lot more programs being developed to getting our top cricketers actually exposed to international venues and international players. I think that’s on the improvement. I know that there are “A” team tours to United Arab Emirates and the sub-continent. I think that’s really important that we get our top cricketers exposed to these sorts of conditions because when you’re not exposed to those conditions, it makes it very, very hard. It’s a known fact that we struggle in sub-continent conditions because we don’t face a lot of spinners here in New Zealand because our wickets don’t turn, so I think the more you can get your skill set around these sort of situations, it’ s only going to make yourself a better cricketer for whatever opportunity comes up. I think the other thing about administrators is that I I’ve talked about the contractual side of being over six months first class. I’d like to see that extended into professional opportunity. Maybe the possibilities of a franchise, I think, could actually work quite well here in New Zealand. It works probably better overseas because there’s a lot more numbers watching it, but why I say that is because I think there are a lot of people here in New Zealand where they’re quite comfortable with their own. I think if you bring a business mentality around it, you could find the actual cricket instruction get a lot better because you’ve got a business involved with it who can actually control it a lot better and run it as a business, and you get the right people, whereas I think now we don’t seem to have that. What happens now is we just sort of let it meander along with what New Zealand cricket board has to offer to our domestic associations. If we can create an environment where we can get more money coming into every association, then you find you get the cream of the cream players coming in, you get the best administrators coming in, and you’re getting the players better opportunities amongst the networks that businesses can offer for life after cricket. Of course player’s associations plays a big part of that as well because they control the players at the moment, so you can get that association working quite nicely, but then I think you’ve got a winning combination of actually creating a wealth of good players in New Zealand that can actually go out and actually dominate international cricket. On that note, I want to end the interview by asking your career has always been a case of what if, if you had to go back in time and change things, what would you have done different? I’ve talked about being managed properly. I guess my personality is such where it is quite open, so I think for me if I were to go back again, I’d probably find a batting mentor, so I would actually have someone whom I can talk to about how my cricket is going, someone with whom I can work out my strengths and weaknesses and I think that could help my development to be a lot better than what it was. I think just more stability, really, just being comfortable in an environment, in any team environment, but again, cricket is such where the demands of a batter is to go out and score runs, the bowler is the same, to get wickets, so for me it’s actually creating a bit of stability around that. I would create a stable working environment if I had to do it all over again (laughs). I’ve had a lot of coaches, and I’ve had some good ones and bad ones, but I’ve got a good glossary of what I think actually works for cricketers now. I would revisit the good and the bad and give it a second chance. I mean, there are many other things as well, but at the end of the day, it’s just about stability, confidence and form.